Hi friends! Welcome to the Perfect Gift Basket For Mom blog hop! If you are coming over from my talented, sweet friend Janet of Shabby Fufu, welcome. I just have to say… is there anything that Janet can’t do? From French Country decorating, to florals, to photography, to tablescapes – this woman does it all and inspires me on a weekly basis! 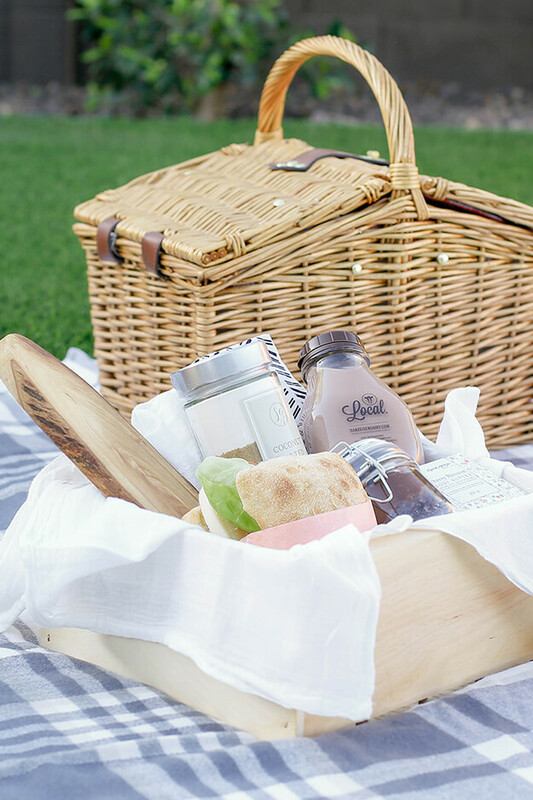 I’m more about time with my kids (-er young adults) than I am about gifts, so I created something that I would personally love to receive – a picnic lunch gift basket! Doesn’t a nice relaxing lunch with your family (that you didn’t have to prepare) sound like the perfect Mother’s Day gift? It does to me. 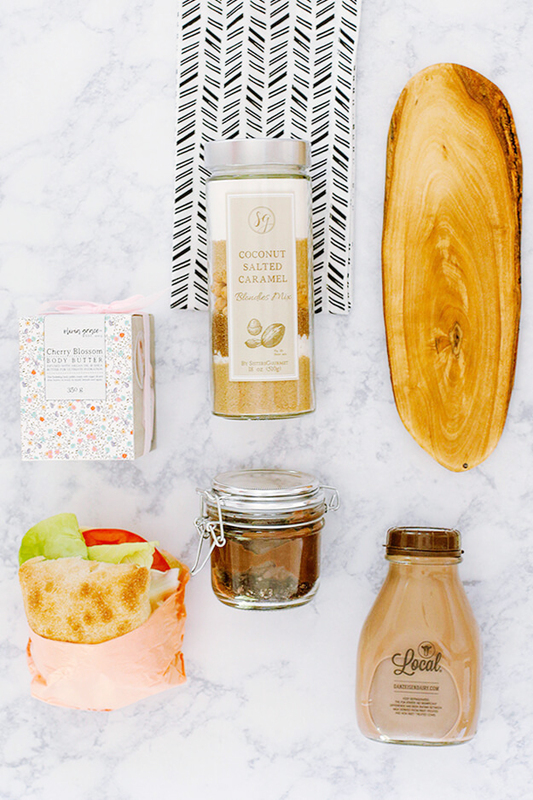 This simple diy gift basket idea for mom is so easy to copy, it’s ridiculous. Finding the right pieces that fit perfectly together can be intimidating to some, but the truth is, it’s a lot simpler than you think. Step 1: Start with the container. I chose a plain wooden crate (purchased at JoAnn’s) to house as my Mother’s Day gift basket. Step 2: Add some pretty cover or filler. I used white flour sack kitchen towels draped over the wooden crate, but napkins (like this black and white herringbone one from World’s Market) or tissue paper works great too! Step 3: Add some food. 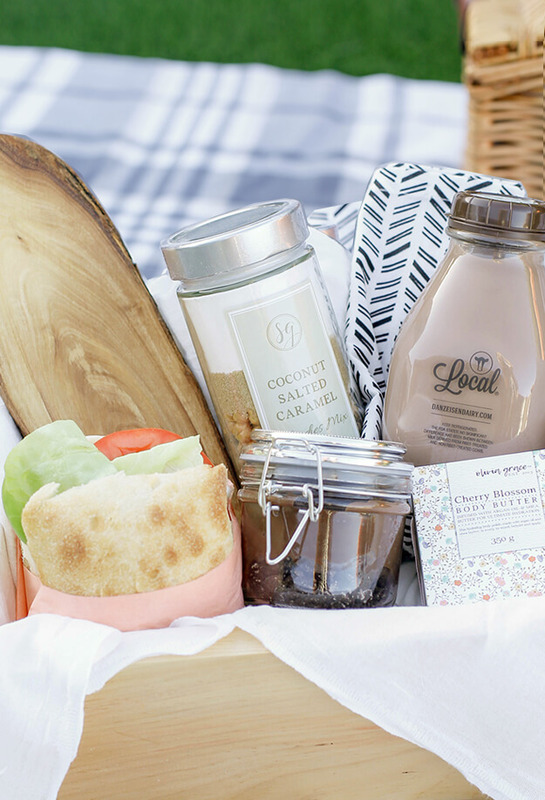 Remember, this is a picnic in a box gift basket, so food to eat is a must! I made a delicious caprese sandwich, with a few items out of my garden, wrapped in colorful tissue paper. I also made a simple, chocolate mousse dessert and placed it in a sealed container jar. Step 4: Add something to drink. There’s so many options to choose from; a pop, seltzer, juice, wine, etc. but I decided to add a nice, refreshing glass of chocolate milk from Danzeisen Dairy – a local, family run dairy farm in Phoenix, AZ. And once the milk is gone, I knew the bottle could be reused in a fun way! 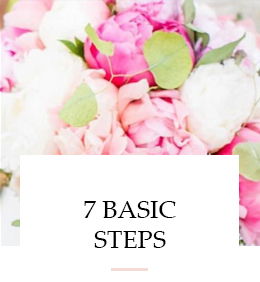 Step 5: Anything else your heart desires. I love cookies, so this Coconut Salted Caramel cookie in a jar was a good fit. The Cherry Blossom body butter was solely chosen for the pretty packaging (don’t judge me: even my business cards tell people that I tend to buy things solely for the design/pretty factor). The cookie and body butter were found at Kirkland’s. And how great is this wooden appetizer board I scored from HomeGoods? I couldn’t pass it up. 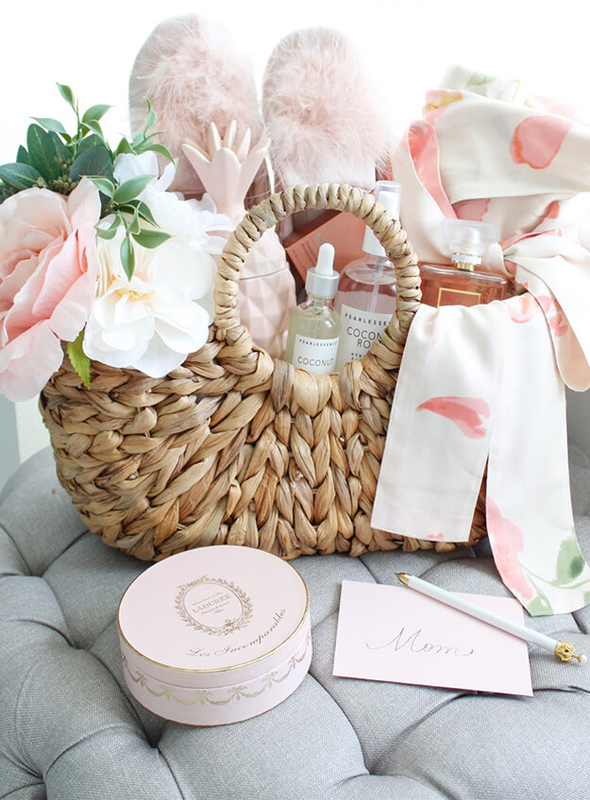 Next, head over to my friend Summer of Summer Adams Designs to check out her luxurious, relaxation inspired gift basket idea for mom. 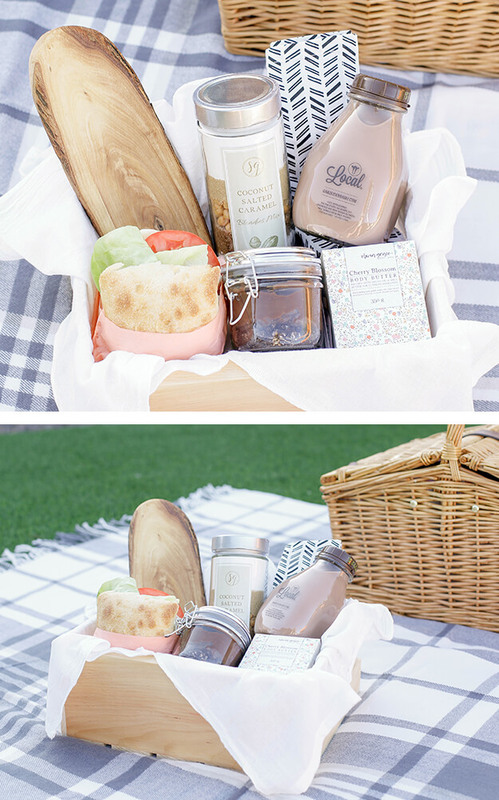 I love your picnic basket idea! My mom would love this because we would be having lunch together! I love all the special treats you included! It’s the time that I treasure… so a lunch with mom is always a winner in my book. Enjoy your lunch with your mom! Love this Tana and I’m liking the chocolate, salted, coconut vibe .. I’m hungry! 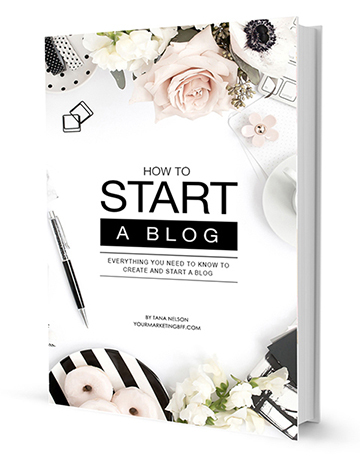 I haven’t made them yet… but I’ll let you know! I bet they taste amazing!!!! It’s my kind of combo too. You have to do this! It could be you and her or you and the girls… she’d love lunch with y’all. You always have such fun, creative ideas. I love this!! It’s easy when you create it around your own loves/desires, haha. This is definitely a gift I’d like to receive for Mother’s Day… or any day! That sandwich.. Oh my yum. Right?! It’s my kind of gift – and yes, it could be ANY DAY of the year! This basket is perfection! I love how you included local things in it! I like to buy local when I can… it also adds that extra personalized touch (if it’s going to someone local).